Saturday November 26 1910 Weather threatening I was at home all day and busy sewing when not at the kitchen work. Will went down town in the afternoon. I had a letter from Harry Mason. Made tatting in evening Sunday November 27 1910. It rained most of the night Weather still ugly so I did not try to go to church. I was reading most of the day when not busy with the work. I read a book in the evening. 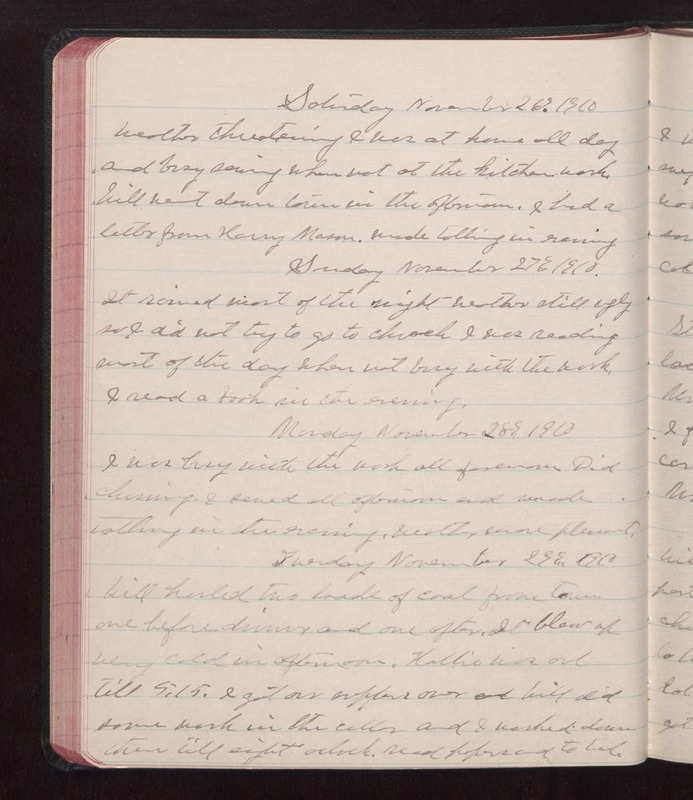 Monday November 28 1910 I was busy with the work all forenoon Did churning. I sewed all afternoon and made tatting in the evening. Weather more pleasant. Tuesday November 29 1910 Will hauled the loads of coal from town one before dinner and one after. It blew up very cold in afternoon. Kathie was out till 5.15. I got our suppers over and Will did some work in the cellar and I worked down there till eight oclock. Read papers and to bed.